Love Don't Cost a Thing is the Y2K.3 version of Can't Buy Me Love, a not half bad 1980s flick (remember Patrick Dempsey? Please say yes; we don't want him winding up on Season Three of The Surreal Life). Not content to leave that minor gem in time capsule paradise, Warner Bros. takes yet another remake from the developmental land of cinematic xeroxing (and creatively lazy), dresses it up in modern day hip-hop surroundings and submits it to the multiplex multitudes thinking easy pre-holiday season grosses (heh, heh, heh). Luckily, the majority of the movie-going public switches on its collective brain every once in a while. Barely a month into its theatrical release, Love lost its lease in first-run movie theaters thanks to a combination of choosy patrons and those waiting for the obligatory home video debut. Those in the latter group are no doubt curious as to whether it plays better in the less demanding, more laid back comforts of an average living room. Well, this is only one man's opinion, but judging by the fact that it took me three evenings to get through this 101 minute film, your money may better invested elswhere. Alvin Johnson (Nick Cannon) is a somewhat lonesome teenager who longs to be part of the "in" crowd. Though not without friends of his own, they're geeky to such a point that sneers and jeers greet their every move in the school hallways, lorded over by jocks and cheerleaders, one of whom Al has an enormous secret crush on: Paris Morgan (Christina Milian). Although he crosses paths with the dancing dynamo occasionally—thanks to his pool cleaning duties for her mom—their worlds don't fully collide until Paris crashes her parent's beloved SUV into a tree. Faced with an expensive repair bill, it's her would-be boy-toy to the rescue, for he just happens to work in the auto body shop where she's brought the vehicle for an estimate. 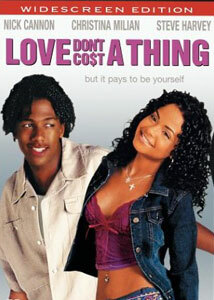 Though far from being the worst teen movie I've witnessed, Love Don't Cost a Thing still agitates more than entertains. For one thing, you can see plot developments coming quicker than a Dionne Warrick psychic friend. Secondly, stock characters you've seen HUNDREDS of times before: the annoying kid sis who never runs out of comebacks; the fat guy who thinks he's hip; nose-in-the-air cheerleaders who can't believe one of their own is hanging out with that guy....and it goes on and on. Even more frustrating is Alvin's way too abrupt personality change once he dons flashy threads attained during a makeover shopping spree with Ms. Morgan; it's sudden to the point that I thought someone spiked his cola with chemicals from (Nutty) Professor Kelp's laboratory. I mean, I expected a hip-hop rendition of That Old Black Magic to materialize at a moment's notice. Equally depressing is that director Troy Beyer had some first-rate casting to work with. Nick Cannon is a potential superstar; his charismatic turn in Drumline made that film one of my favorites in 2003. If he keeps taking roles beneath his talent like this, he could wind up being this generation's Patrick Dempsey. Christina Milian's Paris is cuter than a hospital ward of babies, but her eye-rolling and permanent scowl grow old quickly. Not even reliable funny man Steve Harvey can work his comedic magic to salvage the proceedings. As Alvin's father, there's such a decided lack of chemistry between papa and son that a blood test should be in order. Instead, Harvey looks like he's road testing material Jay Leno style for his headlining monologue on the next Original Kings of Comedy tour. Image Transfer Review: Pretty much up to Warner's high standards, the picture is a tad on the bright side and has no real warmth. It's also lacking that crystal sharpness of most recent transfers I've seen from them as of late. Audio Transfer Review: This is an alternately vibrant and subdued mix that does what it has to very nicely, depending on the mood of the scene. The various party sequences spotlight good use of the rears and a very tight bass combined with efficient imaging emerging from the fronts; the high school basketball sequences are particularly impressive. During the talky moments, it's pretty much standard stuff with the center channel doing most of the work with the occasional directional effect. Extras Review: Of the additional material, the music videos are more entertaining than the movie itself (and 90 minutes shorter to boot). Slightly over 10 minutes of deleted material does nothing to enhance or improve my opinions (except offer the shuddering thought that this film could have surpassed the two hour mark easily). In addition to a typical self-congratulatory puff piece look behind-the-scenes documentary, a forced trailer (for the recent Warner theatrical offering, Torque) occurs for the first time I can remember on one of their discs. Love Don't Cost a Thing? Really? Does that include rental fees and 101 minutes of wasted time? Unless you're a Steve Harvey completist or devoted to Nick Cannon enough to tolerate material that's beneath him, this is one date I'd cancel on.